Looking for a replacement remote for your alarm system? Directed manufacturers remotes specifically for their alarm systems to help making the replacement as smooth as can be. Programming is easy with the included instructions and in no time you'll once again have full control over your security measures. 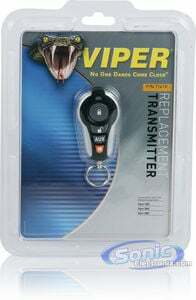 I recently miss-placed my set of keys including my Viper remote I contacted Sonic Electronix and found a direct replacement for my remote. Looked exactly the same and was very easy to program good product so far! My old remotes had broken and would not stay on my key ring. The new ones matched the old ones and were very easy to set up. This was a replacement clicker, I ordered a different model than the original because I liked the metal ring and connector. I broke the plastic one on my old one multiple times. I would recommend getting this as an upgrade. excellent looks for an old alarm system! I bought this remote for my old viper alarm, the original remote look out of style (just a black square remote with 2 buttons), at first I could not believe that I could program it to my alarm but I did some research and the viper website stated that it would work on my old alarm, so I decided to take the risk because I like the looks of it! !